Many are those fettered with chains of sin, and those captivated by bad habits of whose damage and dangers they are completely aware. They stay imprisoned by those habits after their wills are weakened. Habits have their own power over souls and authority over hearts; they become implanted in the human being, and turn into one of his inherent natures, which he becomes unable to change. The essential factor to get rid of a bad habit is to have a firm will, and Ramadan is a divinely educational school where the Muslim believer is trained to strengthen his will by not surpassing the limits of his Lord in everything, to resign to His judgment in everything, and to execute His commands and laws in everything. 1. Having a firm willI have explained above this point. The more the will is strengthened, the more the power of the habit is weakened. 2. The length of the period of changeOne observing the fast abides by the Shariah and is most careful to obey Allah through abandoning his bad habits for a 30-day period, which is enough if the intention of change is sincere. 3. The comprehensiveness of changeThe fasting believer changes the time of his sleep, his waking up, his meals; the ways he spends his time; the arrangement of his priorities and interests; and even his emotions and passions, so the ability to change becomes greater. 4. The generality of changeFasting in Ramadan creates a general attitude of change that encompasses the entire Islamic society. Therefore, each Muslim receives this internal and external change, and this is one of the most important helping factors for accomplishing change. The person willing to change will not be alone, but will find similar change in all the people around him.If you do not succeed in changing despite the existence of many supporters and plenty of time, you may never be able to change at all, and, in this case, perhaps it is not the change you are seeking. If you are unable to get rid of your worst habits in Ramadan, you have deprived yourself of the blessing and wisdom of the Lord of the universe.He has ordained fasting on His servants so that they may change their bad personal characteristics, but some have instead changed only the time of their meals. So do not satisfy yourself with being one of this group, but be one of the wise, pious group who are keen on verifying Allah s purpose and the objectives of His Shariah. 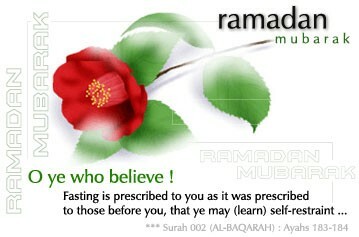 The real aim of fasting is to purify the soul from forbidden desires and customs. Reaching such an aim depends upon renouncing bad habits, and holding on to them is a form of slavery.